Your new baby has arrived – how exciting! The Chic Party Boutique can help you share your wonderful news with style and ease. 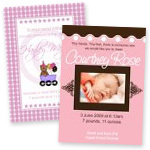 Our stylish range of announcements are available in 3 different sizes to suit every taste and budget. Each announcement can be completed with or without a photo. Our announcements will arrive at your doorstep fully personalised and ready to send. All you need to do is pop your announcements into their envelope, address them and they’re ready for the post. Simple! If you don't find exactly the announcement you're looking for, please contact me – really! 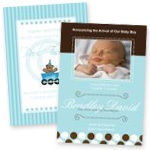 I'd be thrilled to create a personally designed baby announcement just for you and your little one.